Maison Martin Margiela showed its first collection since Martin Margiela's departure from the label was confirmed, on the day owner Renzo Rosso announced he isn't seeking a new designer. There were big fur hats, trompe l'oeil trousers, and chiffon shrouds. Rumors of the reclusive Belgian designer's retirement began swirling after his Spring/Summer 2009 show, which marked his 20th anniversary at the house he founded. The current word is he's going to art school; whatever the case, he had nothing to do with this kind of monstrous sweater. These pants are business in the front. Whereas this model might as well be wearing a mosquito net. Size of a runway model's waist: 24". Size of the waist on these pants: 34". Maison Martin Margiela at has always, at the best of times, made the kind of clothes that prompt the clerks at Loehmann's to look very carefully in the bottom of your shopping bag, to make sure they haven't left some part of the garment — where did that sleeve go? — behind. But it's hard to imagine Margiela ever designing something this witless. Women's Wear Daily reports that many editors didn't even stay through the end of the show, which was held in a cold, red-lit hall. There were some nice touches. I especially liked this beige school sweater that looks like it's not being worn, but held up to the wearer's body. Pity this idea of flatness wasn't enough to keep a whole collection interesting. The restrained use of color was also nice, after the multi-colored excesses of last spring's show. This was the final look. Will Renzo Rosso give in and hire a creative director? 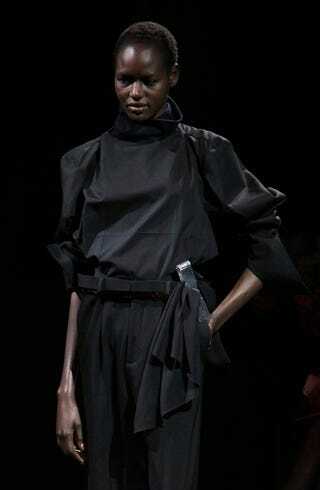 Haider Ackerman and Raf Simons already, allegedly, turned the gig down. And even if, as Rosso has stressed in the past, the "creative team" responsible for the house's most recent collections was mostly assembled by Margiela himself, who always, it's true, favored collaborative work, (and even given that the idea, in fashion, that collections are solely the shining brainchild of head designers is totally fictitious), teams need leaders. And this team clearly lacks for one.